If you’re about to have your first root canal treatment, you might be feeling pretty apprehensive about the whole thing, especially all the stories floating around. Well, no worries all will be revealed in this guide to root canal treatment. Knowing what will happen ahead of time is more than half the battle; you will soon learn that it really is much ado about nothing. So let’s start by dispelling a common myth: Root canal treatment doesn’t cause pain, it relieves it! A root canal treatment in Chandigarh is a simple and painless procedure. Inside the tooth, under the white enamel and a hard layer called the dentin, is a soft tissue known as pulp. The pulp contains blood vessels, nerves, and connective tissue, and helps to grow the root of the tooth during development. In a fully developed tooth, the tooth can survive without the pulp because the tooth continues to be nourished by the tissues surrounding it. 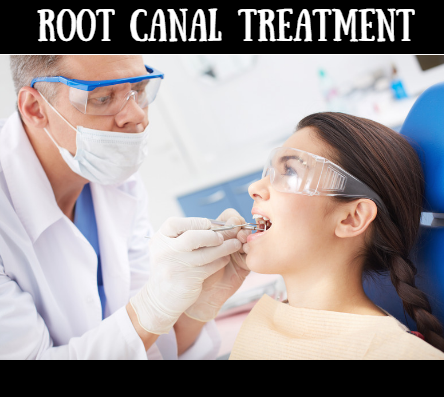 Root Canal Treatment is done to repair and save a badly damaged or infected tooth. The procedure involves removing the damaged area of the tooth (the pulp), cleaning and disinfecting it and then filling and sealing it. Painless root canal surgery in Mohali is done under local anesthesia. When do I need RCT? Drainage and tenderness in the lymph nodes as well as nearby bone and gum tissues. If you have any of the above signs, it is time to visit your dentist for the best root canal treatment in Chandigarh. You need to take a few precautions after the root canal surgery. The following points will also prevent cavities. Avoid eating anything hard and crunchy. Rinse your mouth with salt water for at least two days after the treatment. Avoid eating on the side where RCT has been done. Follow the instructions and medicines prescribed by your dentist. It is essential to visit your dentist on a regular basis as early treatment helps in avoiding further tooth destruction. After all, a stitch in time saves nine. Modern endodontic treatment (Root Canal Treatment) is very similar to having a filling and usually can be completed in one or two appointments, depending on the condition of your tooth and your personal circumstances.